↑ 3.0 3.1 3.2 Rajadhyaksha, Abhijit (2009-08-02). "The Mauryas: Chandragupta". Historyfiles.co.uk. http://www.historyfiles.co.uk/FeaturesFarEast/India_IronAge_Mauryas01.htm। আহৰণ কৰা হৈছে: 2012-03-01. ↑ "Buddhism in Iran, Mehrak Golestan". iranian.com. 2004-12-15. http://www.iranian.com/History/2004/December/Buddhism/index.html। আহৰণ কৰা হৈছে: 2014-07-25. ↑ Boesche, Roger (2003-03-01). The First Great Political Realist: Kautilya and His Arthashastra. পৃষ্ঠা. 11. ISBN 9780739106075. https://books.google.com/books?id=K85NA7Rg67wC. ↑ Sugandhi, Namita Sanjay (2008). 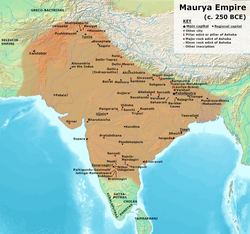 Between the Patterns of History: Rethinking Mauryan Imperial Interaction in the Southern Deccan. পৃষ্ঠা. 88–89. ISBN 9780549744412. https://books.google.com/books?id=8bdULPF4gNYC&pg=PA88. balairudidhibhiriva parchalitsalilaih samantaad uprudham Kusumpurama"
↑ For Harahunas being a group of the Hunas, see also: Early History of Iranians and Atharvaveda, Persica-9, 1980, p 118, Dr Michael Witzel, Harvard University. Kulke, H.; Rothermund, D. (2004). A History of India, 4th, Routledge. Raychaudhuri, H. C.; Mukherjee, B. N. (1996). Political History of Ancient India: From the Accession of Parikshit to the Extinction of the Gupta Dynasty. Oxford University Press.